Armchair fiction presents extra-large paperback editions of the best in classic science fiction novels. 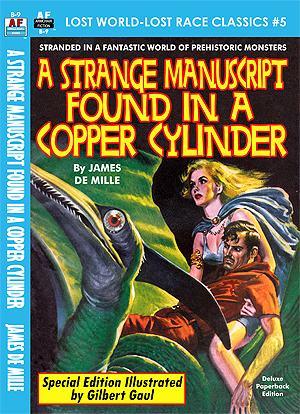 James De Mille's "A Strange Manuscript found in a Copper Cylinder" is the fifth installment of our "Lost World-Lost Race Classics" series. Four bored men, basking away on their yacht, discover a strange manuscript inside a metal cylinder. The manuscript contains the details of one of the most fantastic adventures ever put down on paper. It is the story of Adam More, a British sailor marooned in the wilds of Antarctica. There he discovers a mysterious subterranean tunnel that leads him into an incredible world inhabited by prehistoric beasts and a lost race of death-worshippers. It is one of the most amazing tales you will ever read. This special edition is presented with the original illustrations of Gilbert Gaul, who created the artwork for its original publication by Harper and Brothers all the way back in 1888.